CM Magazine: Jocelyn and the Ballerina. Nancy Hartry. Illustrated by Linda Hendry. Markham, ON: Fitzhenry & Whiteside, 2000. When I go to sleep, I shout "Don't you dare put my Ballerina down the laundry chute." I hang it on my bedpost so I can see it all night. But something happens! Every morning, I find my Ballerina hiding under a pile of dirty clothes. Jocelyn's Ballerina is an old moth eaten tutu and leggings that she claims not only keep her warm, but the twirling skirt pushes her higher and higher into the sky as she dances. She loves it so much, but Mom hates the smelly old rag, and, try as she might, she cannot get her stubborn daughter to wear any other clothes. The Ballerina's day of reckoning draws near when Jocelyn is informed that she is going to be a flower girl in her Aunt's wedding. She will wear a special pink dress, or the ballerina is going "in the garbage." 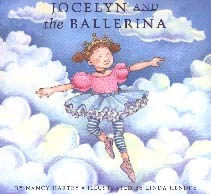 However, the single minded Jocelyn devises a way to wear her beloved Ballerina as well as the hated Pink. The results at the wedding are naturally hilarious. 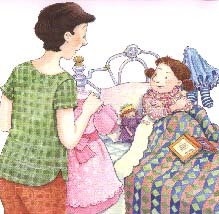 Nancy Hartry's book is a joy, and any child or adult who has or remembers a treasured toy, blanket, piece of clothing, or special place will absolutely love this endearing story. It speaks to the magic of life and imagination that can be found in the simplest of things, and this naturally told tale deserves and ought to be shared with children for generations to come. Ian Stewart is a Winnipeg teacher and regular contributor to CM and the book review page of the Winnipeg Free Press. NEXT REVIEW | TABLE OF CONTENTS FOR THIS ISSUE - September 21, 2001.